Best value in a classic bomber jacket. Zip-away lining panel for embroidery access. Water resistant outer fabric. 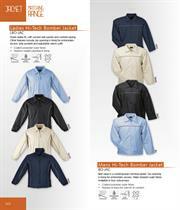 Jacket available in four colourways. 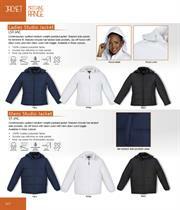 Contemporary quilted medium weight padded jacket. 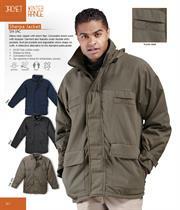 Features include two bar-tacked side pockets, zip-off hood with draw cord and hem draw cord and toggle. Available in three colours. 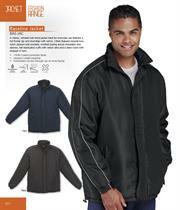 Water resistant outer fabric with micro fleece lining for a lightweight and versatile jacket. 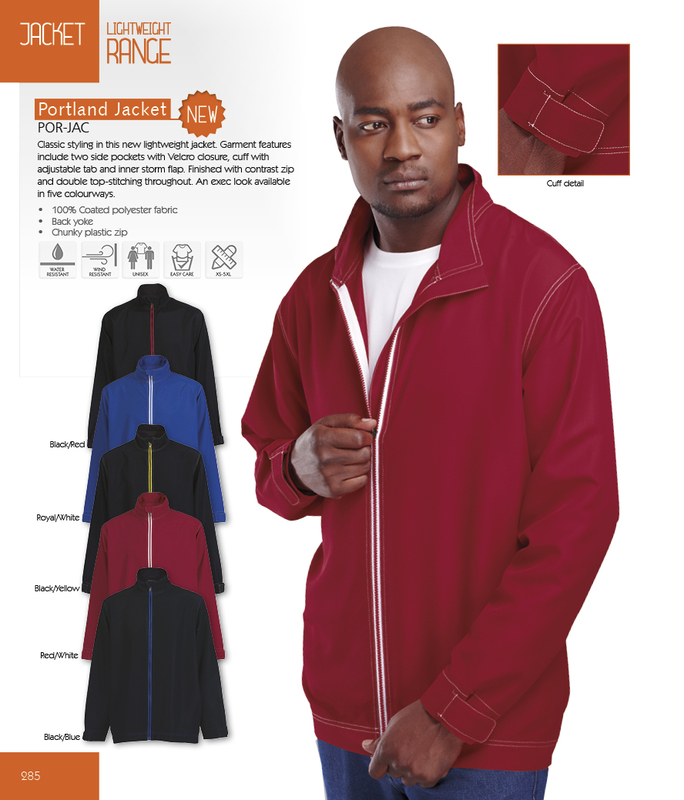 Features include zippered side pockets, full zip front, inner pocket and top-stitching detail. Available in two colours. Lightweight soft shell jacket featuring full zip front with inner storm flap, zip away hood with drawstring and adjustable velcro tabs on sleeves. 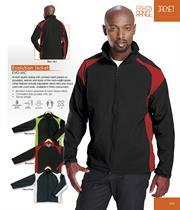 Other detailing includes two zippered side pockets and zippered pocket on left sleeve and hem shock cord with toggles. 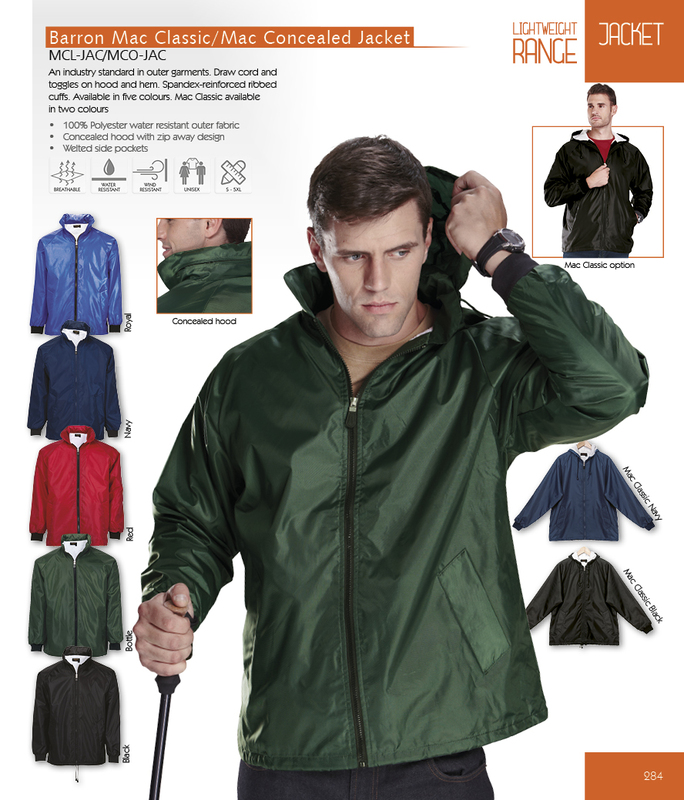 Lightweight fully lined jacket with high-end finishes. Detailing includes full-zip front and storm flap, two zippered side pockets and adjustable cuffs with press studs. 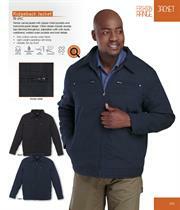 Casual corporate style jacket available in three colours. 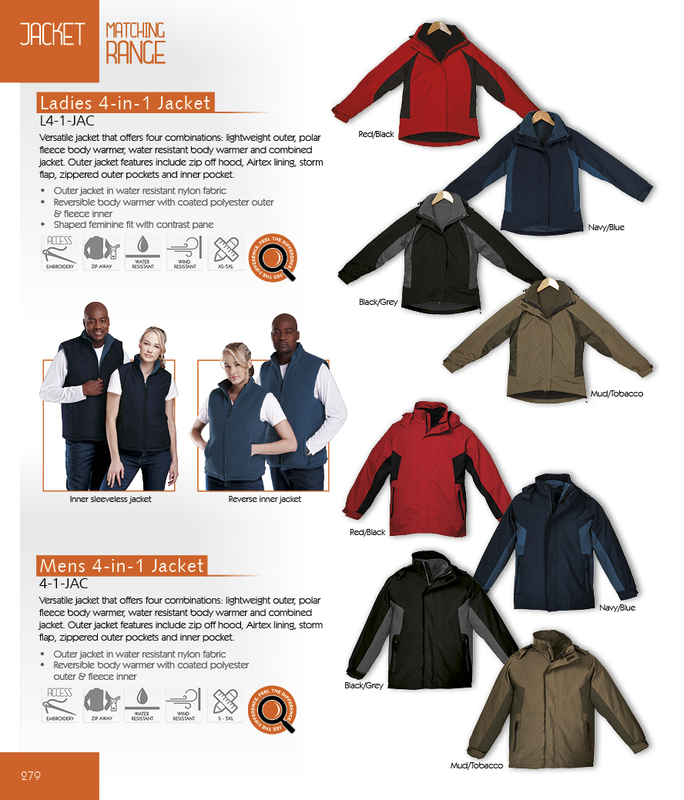 Versatile jacket that offers four combinations: light weight outer, polar fleece body warmer, water resistant body warmer and combined jacket. 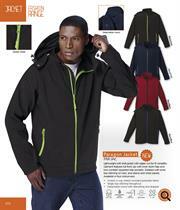 Outer jacket features include zip-off hood, Airtex lining, storm flap, zippered outer pockets and inner pocket. 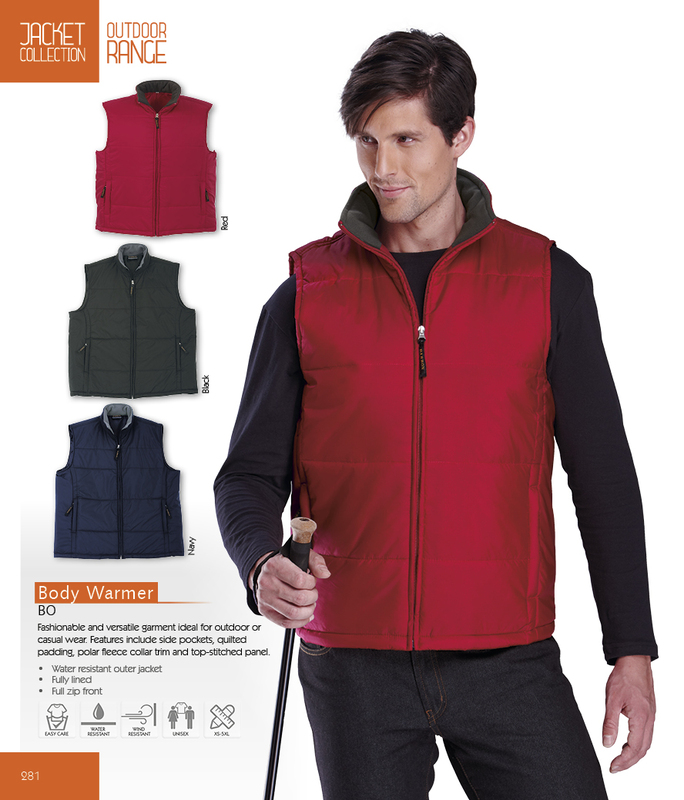 Reversible body warmer with coated polyester outer and fleece inner. 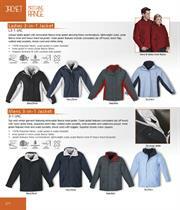 Fashionable and versatile jacket ideal for outdoor or casual wear. 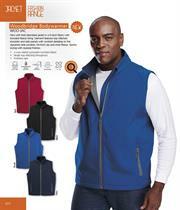 Features include two side pockets, quilted padding, polar fleece collar trim and top-stitched panel. 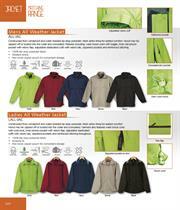 For fishing, hunting, security or outdoor use, this is a must-have multi-purpose action jacket. 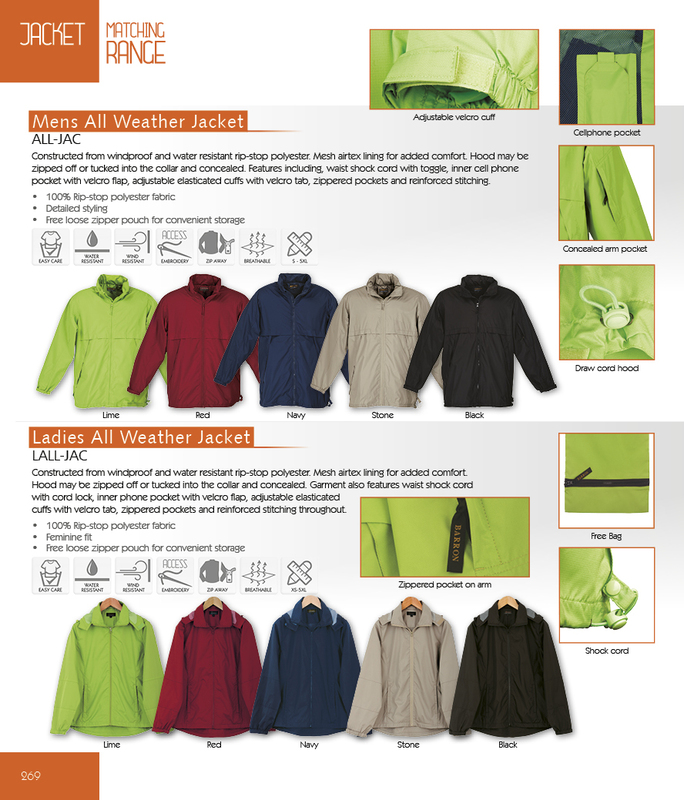 Features include two chest pockets with sub-divisions, inner pockets with water protectors and zippered front pockets. Available in four earthy colours. 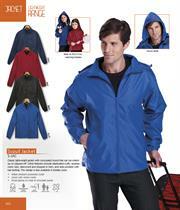 Classic lightweight jacket with concealed hood that can be rolled-up or zipped-off. Other features include elasticated cuffs, durable nylon zips, drawcord and stopper in hem, and side pockets with bar tacking. 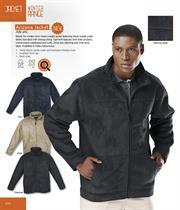 This jacket is also available in kiddies sizes. 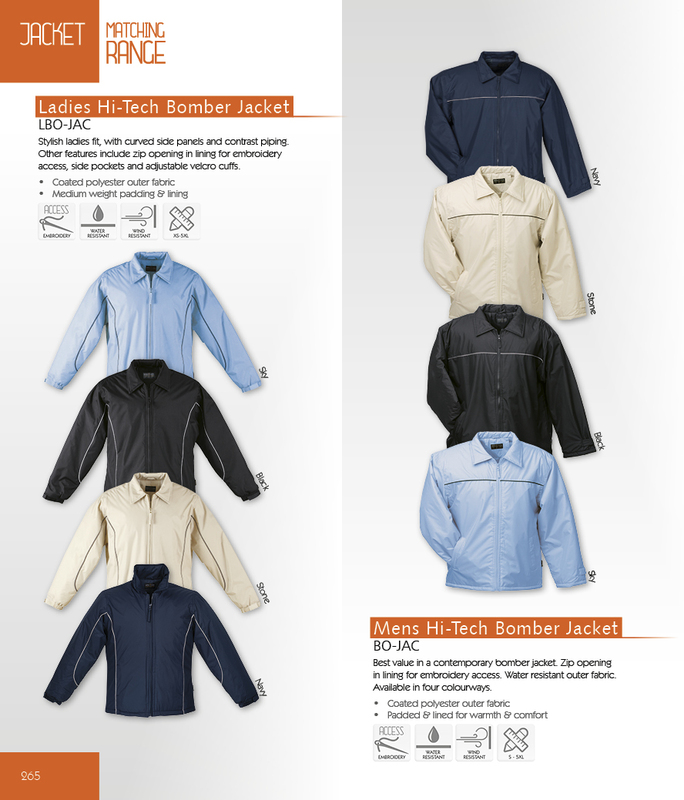 An industry standard in outer garments. 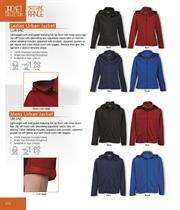 Draw cord and toggles on hood and hem of jacket. Spandex-reinforced ribbed cuffs. Available in two colours. Classic styling in this new lightweight jacket. Jacket features include two side pockets with Velcro closure, cuff with adjustable tab and inner storm flap. Finished with contrast zip and double top-stitching throughout. 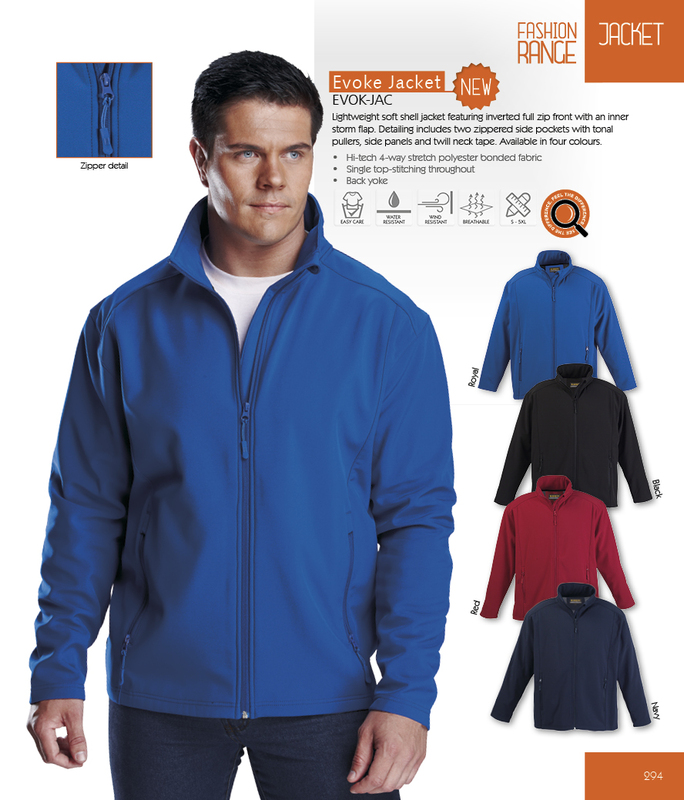 An exec look jacket available in five colourways. 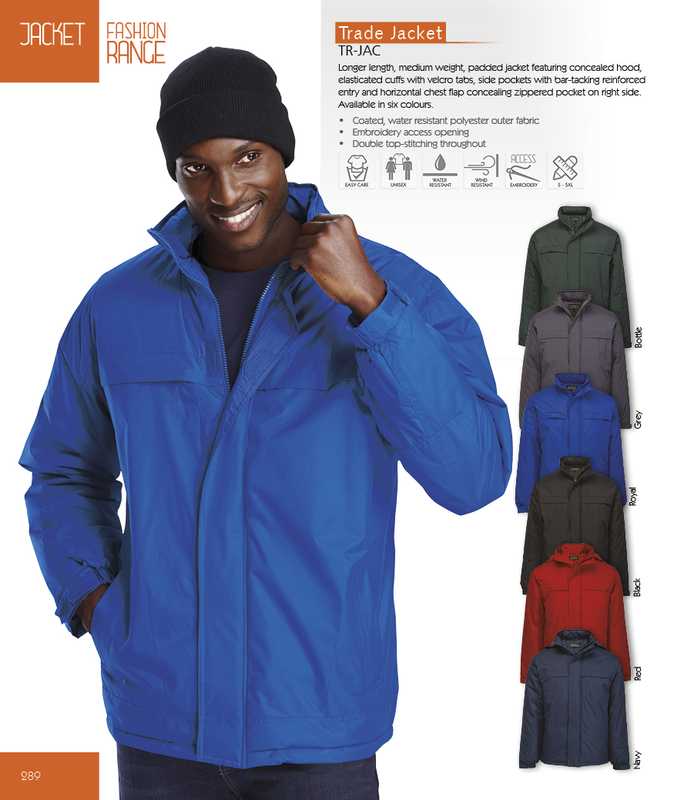 Jacket features a concealed zip-off hood, storm flap on front and on pockets. Shock cord with cord lock in hem. Two inner pockets with phone pouch. 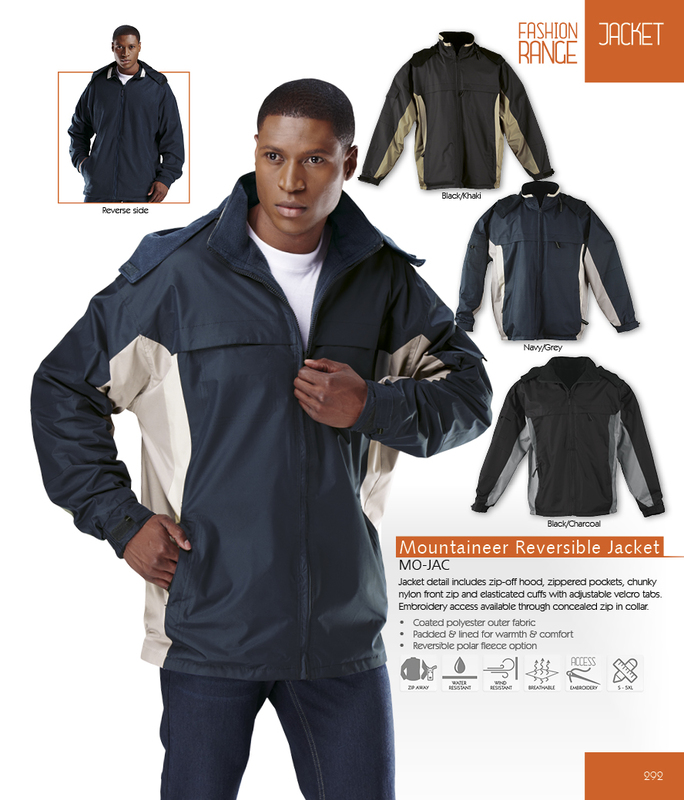 Double top-stitching for durability. Elasticated cuff with adjustable velcro tab. New sporty-feel lightweight jacket detailed with contrast sleeve inserts, piping and inverted full front zip. 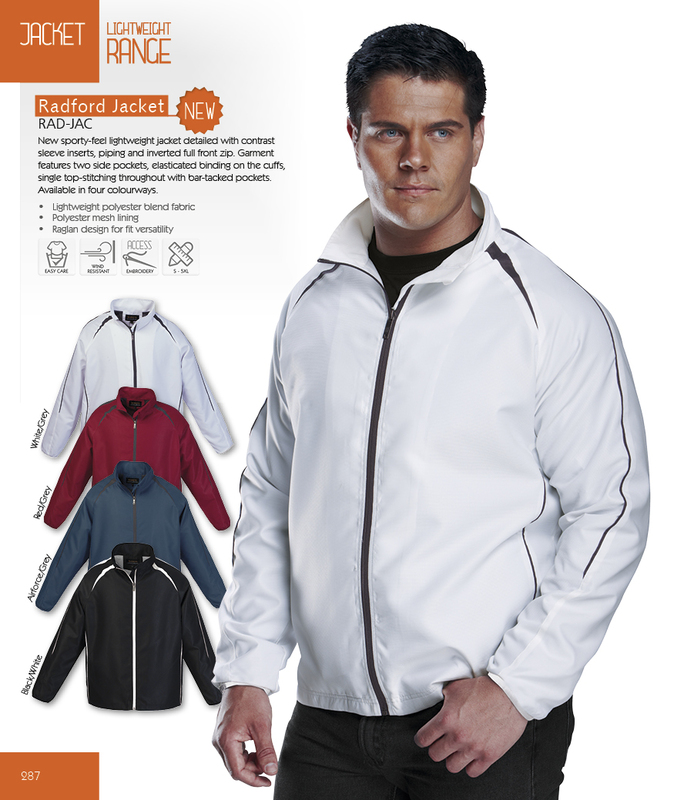 Jacket features two side pockets, elasticated binding on the cuffs, single top-stitching throughout with bar-tacked pockets. Available in four colourways. 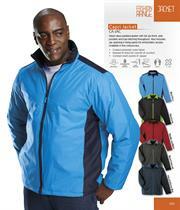 Great value padded jacket with full zip front, side pockets and top-stitching throughout. 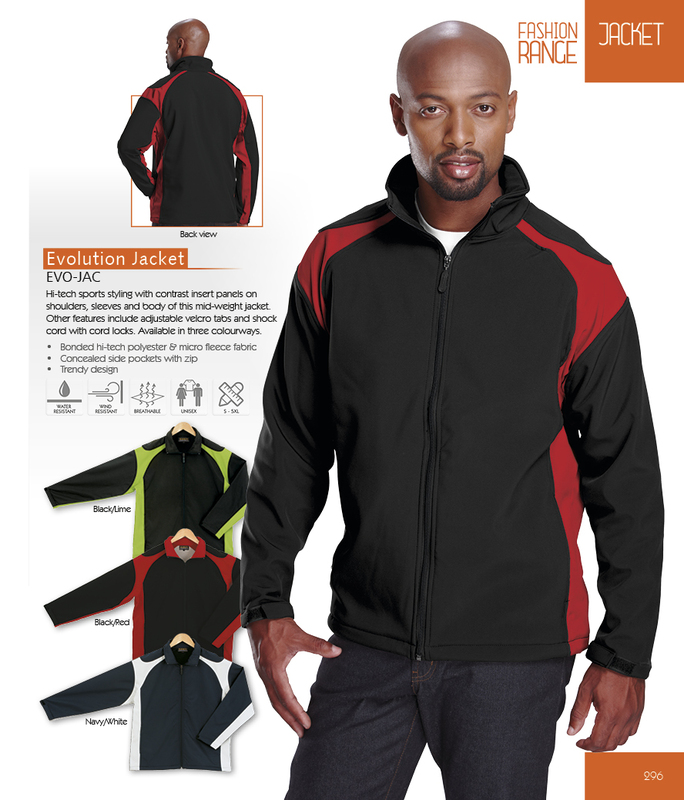 Jacket also includes zip-away lining panel for embroidery access. Available in five colourways. Longer length, medium weight, padded jacket featuring zip-away/roll-up hood, elasticated cuffs with tab adjusters, two side pockets with bar-tacking reinforced entry and horizontal chest flap concealing zippered pocket on right side. Available in six colours. Trendy canvas jacket with zipper chest pockets and horizontal panel design. Other details include double top-stitching throughout, adjustable cuffs with studs, waistband, welted outer pockets and rivet details. 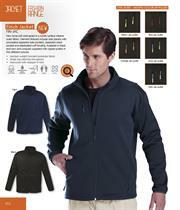 A classic, versatile fully-lined jacket ideal for everyday use features a full frontal zip and stormflap with velcro. 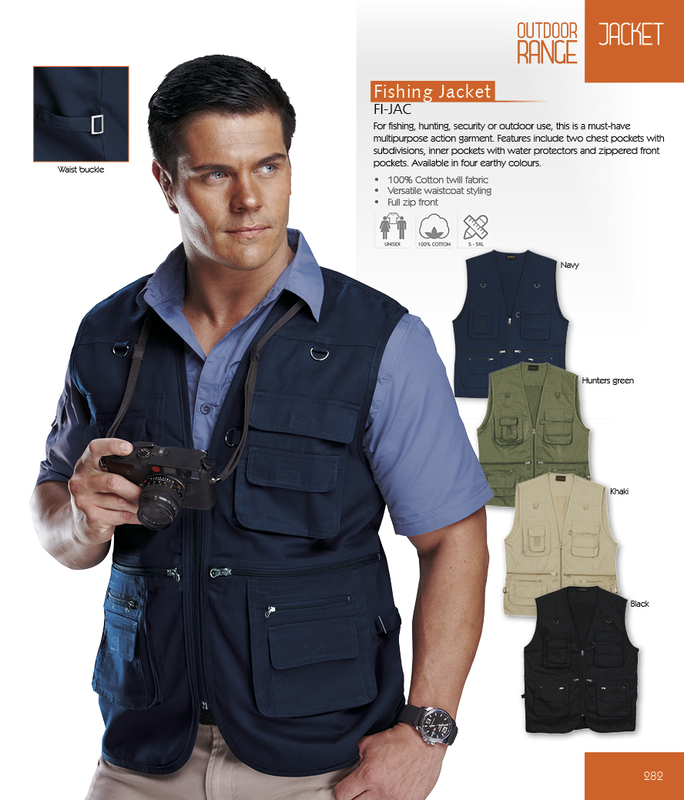 Other features include two nylon zipped side pockets, contrast piping across shoulders and sleeves, half elasticated cuffs with velcro tabs and a draw card with stopper in hem. Jacket detail includes zip-off hood, zippered pockets, chunky nylon front zip and elasticated cuffs with adjustable velcro tabs. Embroidery access available through invisible zip in collar. 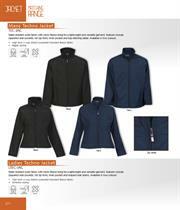 New tonal soft shell jacket in a subtle surface interest outer fabric. Garment features include side panels with concealed zippered side pockets, zippered chest pocket and elasticated cuff binding. Available in black and navy and uniquely supplied with zipper pullers in five different colours. Lightweight soft shell jacket featuring inverted full zip front with an inner storm flap. Detailing includes two zippered side pockets with tonal pullers, side panels and twill neck tape. Available in four colours. Lightweight soft shell jacket with raglan cut for fit versatility. 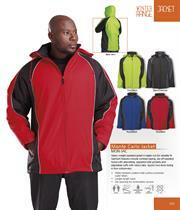 Jacket features full front zip with inner storm flap and two contrast zippered side pockets. Detailed with tonal top-stitching on hem, and sleeve and chest panels. Available in four colourways. Hi-tech sports styling with contrast insert panels on shoulders, sleeves and body of this mid-weight jacket. Other features include adjustable velcro tabs and shock cord with cord locks. 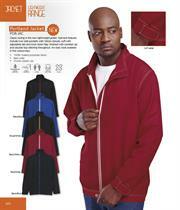 Jacket available in three colourways. New soft shell sleeveless jacket in a hi-tech fabric with bonded fleece lining. Jacket features top-stitched shoulder and side panels with contrast detailing on the zippered side pockets, full front zip and inner fleece. Sporty styling with durable finishes. Jacket available in four colourways. 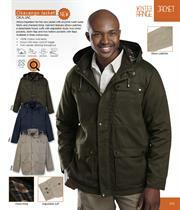 Africa-inspiration for this new jacket with enzyme wash outer fabric and checked lining. 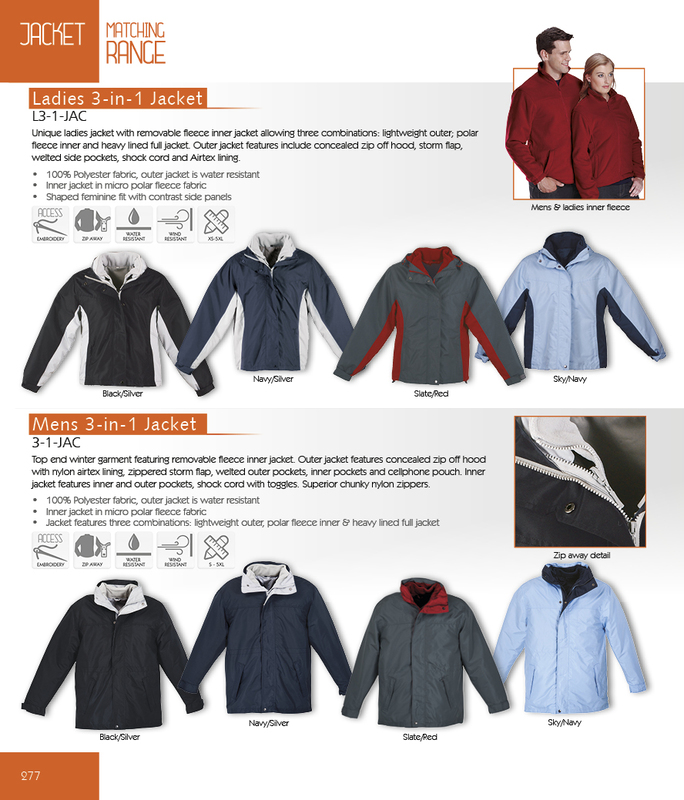 Jacket features elbow patches, a detachable hood, cuffs with adjustable studs, two chest pockets, storm flap and two bellow pockets with flaps. Available in three colourways. Ready for winter. New heavyweight jacket featuring mock suede outer fabric bonded with sherpa lining. Jacket features two side pockets, constructed waistband and cuffs, tonal top-stitching and twill neck tape. Available in three colourways. Heavy weight padded jacket in raglan cut for versatile fit. 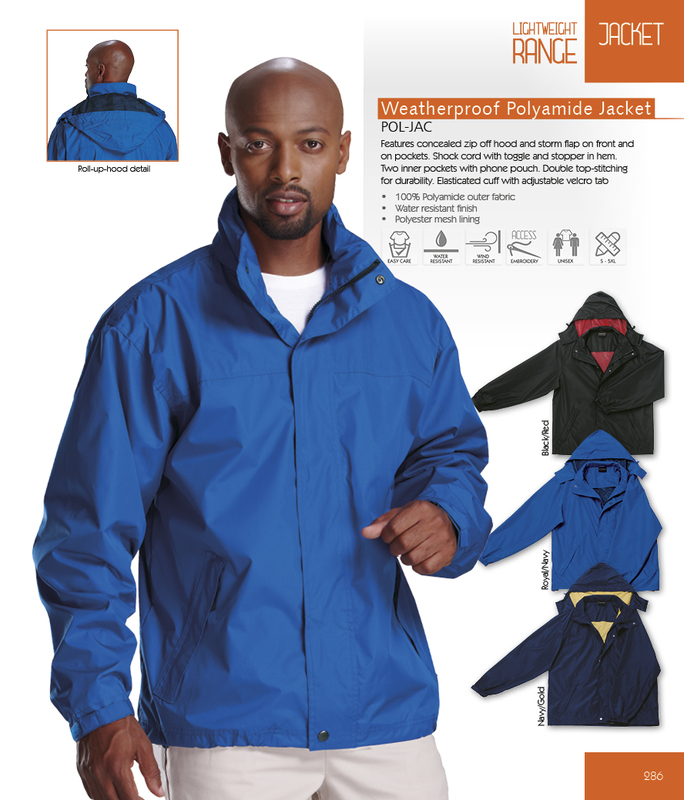 Jacket features include reflective piping for high visibility, zipaway padded hood with drawstring, two zippered side pockets and adjustable cuffs with velcro tabs. Sporty two-tone styling in four colourways. Heavy-duty zipper with storm flap. Concealed shock cord and cord locks. 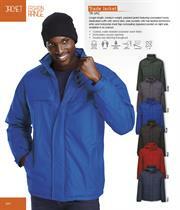 Jacket also features two outer double pockets, front jet pockets and adjustable velcro straps on cuffs. 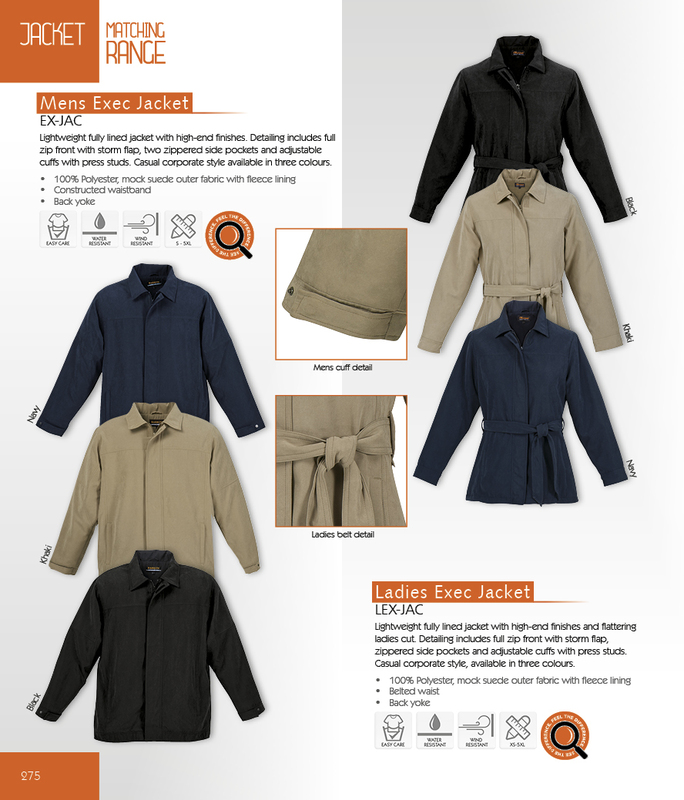 A distinctive alternative to the standard parka jacket. Jackets - Widest selection of fashionable, versatile, weatherproof, windproof and corporate styled Jackets.